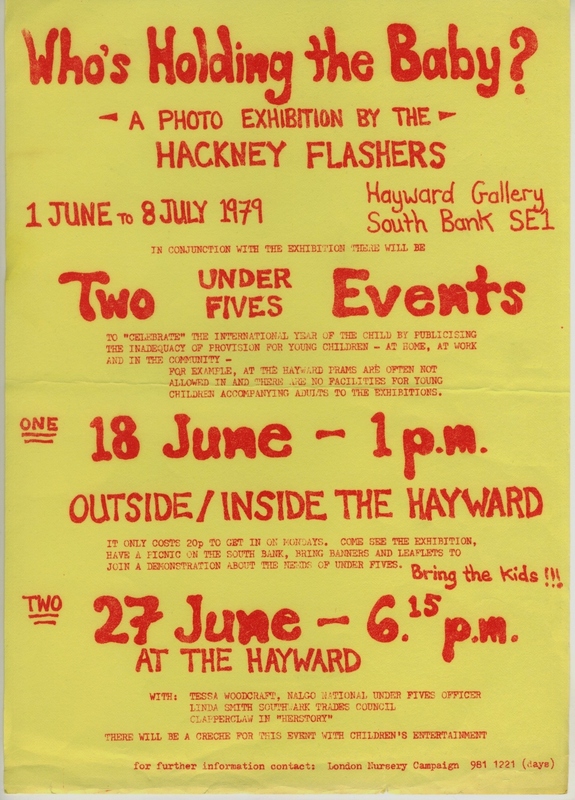 In 1979, the Hackney Flashers’ exhibition, ‘Who’s Holding the Baby?’, was included in the Hayward Gallery show, Three Perspectives on Photography. The work was selected for inclusion by guest curator, John Tagg. Thirty-six years on, in February 2015, the exhibition , on the lack of childcare in the 1970s will be returning to the Hayward Gallery. The issue of childcare is still of major importance in Britain today. The work has again been selected by a guest curator, after the Hayward asked seven artists for their take on Britain for the show History Is Now: 7 Artists Take On Britain. Artist Hannah Starkey, well known for her contemplative, staged photographs of women’s everyday lives, has included the Hackney Flashers’ work in her selection. The Hackney Flashers work has an integrity and an urgency that doesn’t diminish with time. ‘Who’s holding the baby?’ is as relevant now as it was when first shown at the Hayward in the late 70s”. The Hayward exhibition will include 250 objects of art and items from everyday life in an exploration of Britain and it’s recent history. Starkey looked to the Arts Council Collection’s photography collections from the 1970-90s for her contribution. The Arts Council has held copies of ‘Who’s Holding the Baby’ since the work was shown at the Hayward Gallery in 1979. It’s showing then provoked controversy and the work was criticised by the art establishment. The project, which consists of 29 large laminated panels using photography, illustration, text and montage to represent the problem of childcare, was made to be shown in community venues. Its display in an art gallery was also highly controversial within the collective and was hotly debated. I’m a female amature photographer living in Homerton for a year now, and came across your organisation. I’d love what you do and like to be a part of it somehow. Could you please let me know when your next meeting is, and or how i can get involved. Thanks for your interest Ve, the collective is no longer an active photography collective, though there are occasionally events about the work and the history of the group. Work by the collective is now on display at the Tate Britain which may be if interest to you.